At 6-3, 300-pounds he possesses a thick, compact frame with natural girth and power through his lower half. He’s a fluid kid with natural flexibility when asked to coil up into his stance, exhibits good snap awareness and routinely is one of the first linemen moving off the football. Forston exhibits a “plus” first step off the ball and can keep his pad level down on his initial six-inch step. He extends his arms well in both the run and pass game, displaying good length and good hand placement on contact. He also showcases the ability to be violent with his hands when looking to disengage and can control blocks because of his natural power/hand placement. He does a nice job using an opposing blockers momentum against him in the run game, quickly sidestepping on contact and using a compact rip to disengage and close on the play. Forston also showcases some natural suddenness as a pass rusher when slipping defenders as he keeps his hands active, extends his arms well and can make his way up the field. Forston is a “plus” athlete in pursuit. He exhibits impressive range off his frame and when asked to stunt and loop toward the outside he can run the corner well, maintain balance and quickly eat up space. However, despite showcasing the ability to bend and initially keep his pad level down on his first step. Forston has a tendency to consistently get upright off the football in both the run and pass game. This takes away from his balance when looking to disengage, his ability to anchor on contact and his overall push as a pass rusher. You can tell he’s a “plus” athlete for the position, but he needs to do a better job playing lower in all areas of the game. Too often he’s overwhelmed on contact inside when trying to anchor vs. the run as he allows defenders to get under his pad level and he doesn’t have the base needed to maintain balance, hold the point and shed. The same imperfections show up in the pass game where he doesn’t generate the kind of “pop” on contact his physical skill set says he should because of his higher pad level. Now, even when he does get upright he can still slowly overwhelm his blocker, but he gets held up laterally too often when trying to slip/shed and simply doesn’t play up to his talents consistently enough. He also can have a tough time finding the football and will overrun the play inside, but that could have some to do with his lack of considerable experience. He gets a bit wild armed as a pass rusher as well when trying to slip blocks on contact, but again that’s a technique thing that with some coaching and hard work can be improved on quickly. Nevertheless, the biggest concern I have with Forston revolves around his health. He’s missed significant time during both the 2009 (ankle) and 2011 season (knee) because of injuries and his medical report will likely be the key in determining just how high he goes. Impression: The talent is most definitely there. There are some technique flaws that need to be addressed, as he has to play lower through contact in order to play up to his physical skill set. However, he’s an explosive kid who can bend, has a good first step, natural power and is sudden enough to shed blocks in both the run and pass game. 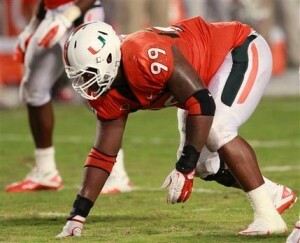 First word: Miami’s defensive line has received some attention due to the emergence of Allen Bailey. While evaluators were watching Bailey, Forston stood out and made some nice plays. He is among several defensive line prospects that are hoping for a Nick Fairley type surge. Forston’s size and bulk make him a legitimate defensive tackle prospect. He has the potential to play either the 3 technique or nose tackle in a 4-3 system. His strong lower half allows him to hold at the point and avoid getting moved off the line. Forston’s success is dependent on his snap awareness which helps him get off the line and penetrate the pocket. I see some upside with Forston but he will need a big season in order to be considered a high level prospect. He just isn’t disruptive enough to warrant a high grade. The biggest issue is his lack of leverage and high pad level. As soon as the ball is snapped, Forston raises his pad level and stands upright impacting his leverage and balance. This also limits his ability to generate a push on the pocket. His hand usage is inconsistent and less than ideal as he doesn’t get his arms extended and into the body of the blocker. Overall, Forston needs to make improvements and create more pressure to be considered a 1st or 2nd round prospect. His ideal fit seems to be as a nose tackle in a 4-3 but the potential is there for him to develop into a 3 technique option. Forston endured an injury-plagued career at Miami. He was healthy as a freshman and it paid off with immediate production. The defensive tackle played in 12 games, made 18 tackles, had 4.5 tackles for loss, and sacked the quarterback three times. Forston received a medical hardship during his sophomore season after playing three games. In 2010 he started 12 games and once again recorded three sacks. He also had an interception and finished second on the team with 12 tackles for loss. Unfortunately, the injury bug bit him again and after three games in 2011, he missed the rest of the season with a knee injury. Afterward, Forston decided to take his talents to the next level rather than risk further physical problems in college. Marcus Forston is an athletic defensive tackle prospect. Pretty well rounded. Good against the run and pass. Pretty agile. Pretty powerful. Can play both DT positions, but I think he works best as a 3 technique. The big thing with him is technique issues and injury issues. Technique issues can be fixed. Injury issues are a question mark. He has to get a full medical clearance for teams to consider him. If he is healthy enough, I think he can make an impact as a 4th or 5th rounder. If not, obviously won’t be considered. But assuming he’s healthy, he could be a nice value later in the draft. The more I read DT profiles the more it seems that this is a very deep position. Reese will draft one. Will it be early ? Late ? I don’t know. Btw, do we have a NT and a 3-technique or do our guy play both techniques depending on downs ? They shift to different techniques and lineups, even switch sides. The versatility of each player allows Fewell to do that. I think the basic lineup from left to right is 5 technique, 3 tech, NT with a right shade and 5 technique. Which is what most 4-3 teams do now, years ago it was a balanced line with the DTs playing a 2 technique. I think you’ll even see a lot more teams switching between a 4-3 and 3-4 lines in different packages. That’s why the no huddle offense will become more effective, something Eli runs to perfection.